The 12 days of Christmas? For actor James Carpenter, it’s more like the 12 years of A Christmas Carol. This will be his 12th year gracing the Geary stage as tightfisted Ebenezer Scrooge. Carpenter has frequented A.C.T. stages for nearly 20 years, from Glengarry Glen Ross (2001) to Rock ’n’ Roll (2008) to Heisenberg (2018), and he’ll be playing Charlie in Edward Albee’s Seascape this coming January. But first, he returns to Scrooge. We recently sat down with Carpenter to hear about his intimate knowledge of this iconic character. 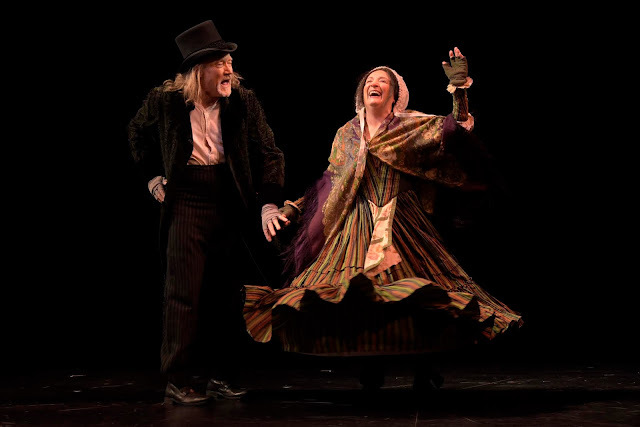 James Carpenter as Scrooge and Sharon Lockwood as Mrs. Dilber in A.C.T. 's production of A Christmas Carol (2017). Photo by Kevin Berne. How does it feel stepping back into the role of Scrooge? Does he feel like an old friend? I don’t know that I’d call Scrooge an old friend. A mutual combatant, perhaps. A role I know I’m going to have to gird my loins for and ready myself to take on. This year, Anthony Fusco is bearing the brunt of the load because I will be in rehearsals for Seascape a bit after we open Carol. I know the kind of stamina and strength—with which Anthony is supremely equipped—it will take to carry the role. It’s very physically taxing. Scrooge is offstage a total of about 20 seconds the entire show, and it takes laser focus and precision to carry off the role cleanly and do it justice. A mini King Lear. Do you discover new aspects of the text or your character? I always, always discover new things every year. Domenique Lozano, our director, insists on finding new ways to open the piece up again so we can see it with fresh eyes. One year, she asked me not to look at anyone, even when addressing them directly. It was surprisingly difficult and even though we didn’t wind up doing it all the time, we found a valuable color for that year’s production. A way to steer. We’re always asking questions about moments, re-examining choices made in previous years, and exploring new paths through scenes. All of the regulars in the cast encourage new input from the M.F.A. and Young Conservatory students, and we look for new dynamics in each scene and stay open to the fresh ideas that these new cast members bring to the plate. And we remember the spirit of what Dickens wrote. It’s a gift, a reminder he gave to the world. Get in the holiday spirit by joining us for A Christmas Carol, running December 6–29 on A.C.T.’s Geary stage. Get your tickets today!